Dart boards are a beloved bar staple that can provide you with hours of enjoyment. If you want to bring some of that friendly competition home, you can create a setup in your very own man cave. Setting up an area in your home will let you brush up on your darting skills and play a variety of games in an environment that you’re comfortable with. While most people think that hanging a dart board up is as simple as mounting it on a wall, there’s a bit more that goes into planning a play area. There are official measurements that you have to take into account when planning your setup to ensure that you recreate an authentic darting experience. Fortunately, getting the job done is pretty simple. With a bit of careful planning, some patience, and a trusty measuring tape, you’ll have that dart board up and ready to go in no time. First things first, you’ll need to find the appropriate spot in your home or man cave to hang your dartboard. 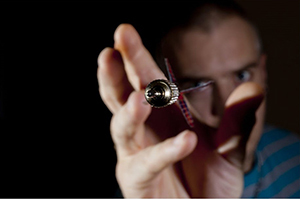 While it may seem like an innocent game of fun, dart games do pose a small danger risk. After all, you are throwing sharp objects. To make sure that you and everyone around you remain safe, find a spot that has a considerable amount of room. In a bar, you’ll often find the dartboard area somewhere in a corner. This is one of the best spots you can choose because it’s out of the way. The last thing you want is someone accidentally walking into your throw line, so choose a spot that has no foot traffic and is easy to see. Also, allow for plenty of room around the throwing area. Avoid cramped spaces that force you to stand too close to the person throwing. Darts can easily hit a hard surface and ricochet in another direction. Keep the immediate area free of fragile items and you’ll be good to go. Once you’ve found that perfect spot, you’re going to need to start taking some measurements. Dartboard placement is one of the most important components of the game. It’ll ultimately affect your technique, so you’ll want to make sure that you take the time to get it right. Always remember to measure twice and mount once. There are a number of dart game organizations around the world. These include the World Darts Federation, British Darts Organization, and Professional Darts Corporation. These governing bodies have created standard measurements that are used in professional competitions and local bars alike. They ensure that everyone is on a level playing field and that the experience remains the same wherever you go. What is the Right Height to Hang a Dartboard? The standard height measurement of a dartboard is 5 feet, 8 inches off the ground. This equals 68 inches, 1.73 meters, or 173 centimeters. This is the official height for both steel-tipped darts and plastic-tipped darts regardless of where in the world you’re playing. It’s important to note that height doesn’t start at the bottom of the board. Instead, it’s measured from the exact center of the board. When you’re figuring out the measurements, have a friend hold the board on the wall and measure from the middle of the bullseye to get an accurate number. How Far Should You Stand from the Dartboard? After you have found the right height to place the board, you’ll need to figure out the standing distance players would need to be when they throw. This is another important measurement because it can have a big effect on fairness and technique. The internationally-recognized standard differs slightly for steel-tipped darts and plastic-tipped darts. For steel-tipped darts, the horizontal distance to the throw line needs to be 7 feet, 9 and one-quarter inches. This is equivalent to 93.25 inches, 2.37 meters, and 237 centimeters. For plastic-tipped darts, the standard distance is 8 feet even. This comes out to 96 inches, 2.4384 meters, and 243.84 centimeters. 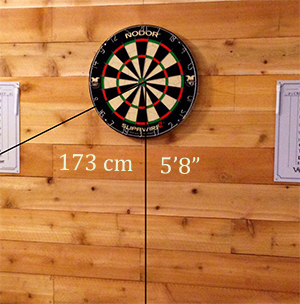 This distance should be measured from the surface of the dartboard, not the wall. If it would be easier to measure from the wall, take note of the thickness of your board. Most dartboards have a thickness of 1 and a half inches. Simply tack on that thickness to the standard horizontal distance figures and measure from the wall accordingly. What’s the Distance from the Dartboard Bullseye to the Throw Line? 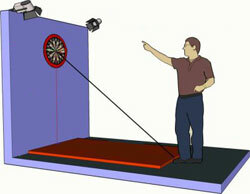 Another way that you can measure distance is from the bullseye to the throw line. If you look at the setup from a side angle, you can visualize the board height and horizontal distance from the throw line as a right triangle. This last measurement would be the diagonal hypotenuse line connecting the bullseye to the throw line, or oche, on the floor. You can use this measurement to quickly figure out where players should stand. Simply have a friend hold one end of the measuring tape at the center of the board and create a taut line to the floor. The international standard is 9 feet, 7 and three-eighths inches. This is equal to 115.35 inches, 2.93 meters, and 293 centimeters. This is for steel-tipped darts. For plastic-tipped, it would be roughly 9 feet and 9 and three-quarter inches. This can also be measured in 117.75 inches, 2.98 meters, or 299 centimeters. Getting your dartboard in the right spot can make a world of difference in how you play. Once it’s perfectly positioned, you’re ready to start throwing. However, there are a couple of other things you consider to make the most out of your setup. The throwing line, also referred to as the oche, is where you’ll be playing from. If you have already found the appropriate horizontal distance from the board, you’ll need to find a way to mark it. One of the easiest methods is to use duct tape. It’s readily available and durable enough to withstand a rowdy game. When you’re placing the tape, make sure that the front edge is lined up with the distance measurement. Doing so allows players to stand directly on the tape and get as close as possible. In professional games and many bars across the world, a thin piece of wood is often used. They’re typically attached to the floor directly and rise up approximately an inch and a half off the ground. This makes it easier to get right on the throwing line without having to worry about stepping over. While it may seem tempting, leaning over the throwing line in a dart game not accepted. 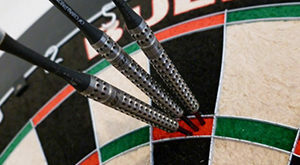 The act is deemed illegal by the various darts governing boards around the world. Leaning over the line will shorten the throwing distance and give you an advantage over players that don’t do this. Essentially, it’s cheating. Why is it called an Oche? 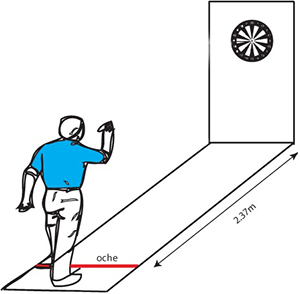 Many casual players are often confused by the term “oche” when it’s used in professional settings. It was introduced by the British Darts Organization many decades ago and has stuck. 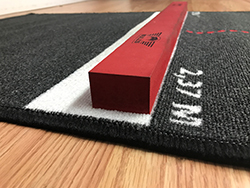 Oche is an old Flemish word that essentially means “notch” or “nick.” It refers to the small raised piece of wood that defines the throwing line. If you want to keep your gear safe, you’re going to want to find a place that has suitable floors. The best type of material is hardwood or tile. Harder materials like concrete will only cause damage to your steel-tipped darts when they hit the floor. 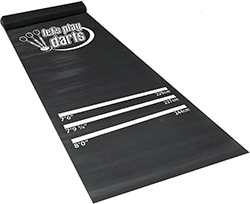 If you want to add a bit of protection and comfort to your playing area, you can invest in a dart mat. These mats are made from a durable vinyl material. They’re usually 10 feet or more long and roughly 3 feet wide so that you have plenty of room. Simply unroll it and place it against the wall where your dartboard is mounted. Most units have pre-measured throwing lines printed directly on them for both steel-tipped and plastic-tipped darts. The printed oches will keep your game fair and the mat as a whole can further define your playing area for safety. Setting up a dartboard in your home isn’t a difficult process with the right tools and careful planning. Once the board is up, you can play competitive games just like the professionals. With some other accessories, your playing area will be the go-to spot for fun.